Special Applications Transducers include combination longitudinal/shear mode transducers, polymer (PVDF) immersion transducers, captive water column transducers and many more. They provide solutions for a variety of applications in flaw detection, thickness gaging, and materials research. Roller transducers are used in testing metallic or non-metallic materials for bonding/segregation in CFRP/GRP including Kevlar®, rubber friction materials, and high density products such as glass, and metallic and plastic weldments. This series includes roller and contact type transducers at 0.5 MHz and 1.25 MHz. Contact units are available in 5, 10, and 15 mm diameters, while the roller transducers incorporate a 5 mm crystal giving a 10 mm footprint through the replaceable tire. Both styles are fitted with axial mounted Microdot connectors (other connectors available on request). The roller transducer can be ordered with either a single or dual yoke design. Roller transducers are used in through transmission mode for fast linear scans of parts without the need for an immersion setup. 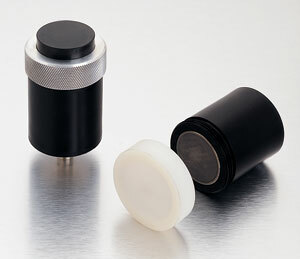 Roller transducers are typically used in applications looking for de-laminations in multilayer materials and are available in either single or dual yoke designs feature a removable and replaceable tire. This transducer can continuously withstand temperatures as high as 350°F (175°C) and pressures up to 85 PSIG. One typical application is to monitor the cure of materials in autoclave. Meant for use in pairs for through transmission in materials such as concrete, wood, and geological samples, these are available in frequencies of 50 kHz (X1021), 100 kHz (X1020), and 180 kHz (X1019). Recommended instruments are high voltage pulser-receivers such as the Model 5058PR or 5077PR Square Wave Pulser. This highly damped transducer measures the thickness of fiberglass, composites, and other attenuating materials. This transducer can also be used with a NWC-302 Nylon Wear Cap for flaw detection on thick or rough surfaced casting materials. Part number is M2008, (1 inch, 25 mm diameter). The Variable Angle Beam Wedge allows the user to adjust the incident angle from 0° to 50° to create refracted angles in steel from 0° to 90°. The wedge is to be used with the 0.50" x 1.00" Standard Angle Beam Transducers (see Angle Beam Transducers).